Greater Manchester Police (GMP) has welcomed 100 new police officers to the ranks. The new recruits were sworn in at an attestation ceremony at Harrop Fold School in Worsley on Thursday night. It is the first time an event of this kind has been held at a community venue. Chief Constable Ian Hopkins, Police and Crime Commissioner Tony Lloyd and Magistrates Peter Rogerson and Zahid Maqbool were in attendance at the legally binding event. Family and friends of the new officers watched on proudly as each of them made an oath to uphold the office of constable with fairness, integrity, diligence and impartiality. 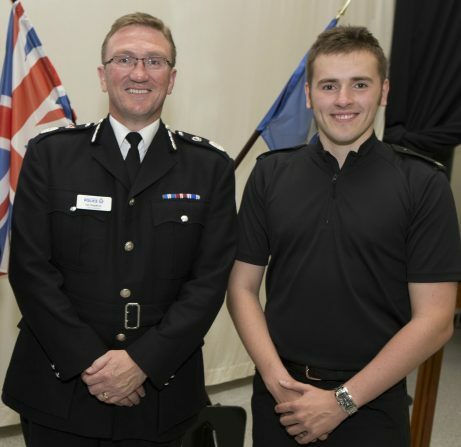 Chief Constable Ian Hopkins chose to hold the attestation at Harrop Fold School, rather than a police building, to emphasise to the new recruits what it means to be a police constable. He said: “The primary role of each officer is to help and serve the public, therefore it is only right that we hold this attestation at the heart of community, where it should be. On what lies ahead for the new officers, Chief Constable Ian Hopkins said: “Policing is now more challenging and complex than ever before, with significantly more scrutiny now being placed on officers, which is rightly to be expected. “Due to the rigorous selection process and training involved, plus the emphasis we place on supporting each other at GMP, I have no doubts that these officers will meet any challenges that lie ahead. All of the new recruits have previously been employees with GMP, either as Police Community Support Officers (PCSO), Special Constables, apprentices or police staff, and will build upon their existing skills and knowledge involved with policing. The 100 new officers joining GMP will maintain the total overall number of officers at current levels. Meet Jonathan Wyatt, 22, from Salford. A keen sportsman, in his spare time Jonathan plays tennis and also referees’ football matches at semi-professional level. After graduating with a degree in Geography in July 2015, Jonathan joined GMP in Salford, working first in the Property Office before moving in to the Public Protection Investigation Unit as an Operational Support Officer. In December 2015, Jonathan became a Special Constable in Salford, before starting his officer training. Once his training is complete, Jonathan will be a Police Constable based in Altrincham, Trafford. Jonathan said: “I’ve always wanted to be police officer, since watching television programmes as a young child. “Due to my previous roles in Greater Manchester Police, I feel I’ve gained a broad knowledge of how the different areas of policing work, both operationally and behind the scenes. On his plans for the future, Jonathan said: “After my probationary period as a Constable has ended, I hope to complete the Detective’s course.